Scroll down to see the weekly listings in the Help Wanted and Real Estate sections. Click here to view the full classified listings. Description: Caregiver needed. Honest, reliable. Live-in, with a reference, with a small amount of fee. 937-9850 or 964-5444. Description: Caregiver to work 12-4pm T/Th/Sat. Call 502-459-3771. • Pays attention to detail. • Promoting a positive interaction with others exhibited by maturity, respect and a team centered approach. Description: The Pax Christi Collaborative Parishes of St. Therese, Our Mother of Sorrows, and St. Elizabeth of Hungary are seeking a qualified candidate who will be responsible for the maintenance operations and upkeep of the buildings and grounds of our three parishes. This is a full time position, Monday through Friday, with availability for after-hours emergencies. Includes benefits and work mileage reimbursement. The ideal candidate will have a minimum of three years’ experience in general maintenance and repairs, experience overseeing subcontractors and have a working knowledge of HVAC and plumbing systems. Requirements: a valid drivers license, vehicle to drive between the three parish campuses, criminal background check, ability to use cell phone and e-mail. Email your resume with salary requirements to: PaxChristiJobSearch@gmail.com. Description: The Pastoral Associate is responsible for the daily care of the faithful. He/she shares in the responsibility of the need assessment, decision-making, planning and implementation of a variety of parish ministries and operations. The Pastoral Associate is more of a generalist than a specialist. 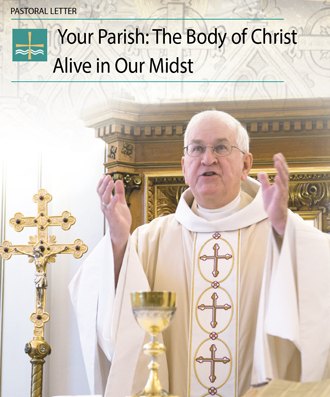 In collaboration with the pastor and other staff ministers, the pastoral associate integrates a variety of ministries within the overall parish mission. Qualified candidates will have a Bachelor’s degree (or equivalent) and 3 to 5 years’ experience, and have experience coordinating a large variety of ministry efforts including parish administrative responsibilities. St. Frances of Rome is a warm, welcoming and diverse community of parishioners. Description: St. Raphael Parish is seeking a part-time Children’s Formation Coordinator. The ideal candidate possesses vision and brings strong leadership skills to develop, form, and lead our children. The Coordinator will be responsible for helping St. Raphael Parish formulate and carry out a vision and comprehensive model for Children’s Ministry in Pre-K to 5th grade. The ideal candidate embraces innovation, while balancing the need to patiently change the culture through effective leadership. Description: Family owned Catholic-based care agency seeking honest, dependable caregivers to provide lite housekeeping, personal care and companionship to the elderly. Competitive pay and flexible schedule. For more details please call 502-882-3049 or apply online at www.mercyworkslouisville.com. Description: Looking for farm hands to work for a feed company. Manual labor loading & unloading trucks filled with hay, straw & grain. 6 days/wk, $14/hr. Need own transportation to get to farm. Located 2 miles from St. Rita Parish. 502-551-7357. Description: Epiphany Catholic Church, in Louisville KY, is seeking a creative and energetic individual to serve as a full-time Pastoral Associate for Community Life. Responsibilities include assisting with pastoral care of parishioners, coordinating parish outreach to those hospitalized, homebound, or grieving. This position also coordinates parish life activities that promote community and goodwill among parishioners. Candidates should possess good organizational, communication, and interpersonal skills. They should also have some Pastoral Ministry experience and flexibility to work some evenings and weekends as needed. Candidates must be fully initiated practicing Roman Catholics and comfortable working with diverse populations. Prefer candidates with an academic degree in a related field. Proficiency in Spanish is a plus. Interested candidates should submit a letter of interest, noting salary requirement, with a resume and any other relevant documentation to apply@epiphanycatholicchurch.org or Pastor, Epiphany Catholic Church, 914 Old Harrods Creek Road, Louisville, KY 40223 on or before Friday, April 26, 2019. 4024 MIDLAND AVE. $239,900. 4BR, 2BA, living rm., dining rm., kitchen. 1,800 sq.ft. Full unfinished basement. 1C attached garage. 75’x200’ lot. 8k backup generator. Hikes Point area. Gulf Shores, AL. Beach club resort. 1,2,3 and 4 br. Call/text 502-807-7263, abtrksvc@aol.com. Panama City Beach. Near Pier Park. 1,2 & 3 br. gulf front condos. 502-807-7263, abtrksvc@aol.com. Submit classified ads to classifieds@archlou.org or call 502-471-2125. Line ads may be placed by phone or mail Monday through Friday from 8:30 a.m. to 4:30 p.m. Payment in advance is required. All major credit cards accepted. Deadline for space reservation is Thursday at 2 p.m. Deadline for display ad content and supporting design elements is Friday at 2 p.m.